Now Zinfandels are not immune to Californiazation. Witness Turley, whose Zins are huge huge huge, with some of its wines approaching 16% ABV. Or, go the other way and behold the torrents of White Zinfandel being produced–bland sugar water with all the substance of a waiter/aspiring actor. Zinfandels are the most Californian of all grapes, composing 10% of all vines planted in the state. Zin came to the Golden State during the Gold Rush of the late 1840s and early 1850s. These vines are survivors, many having lived through that vinous nightmare known as Prohibition. (And though we are quick to dismiss White Zinfandel, it was White Zin’s popularity during the 70s and 80s that saved old vineyards from being ripped out to be replanted with more financially-successful varietals.) Thus, more than perhaps any other type of varietal in the United States, we see very old Zinfandel vines–60, 80, and even 100+ year-old vines are not uncommon. Old vines generally produce small yields with grapes that have very concentrated proportions of sugar and flavor vis-a-vis younger vines. And, at the hand of master winemakers, old-vine Zinfandel can be incredible. Founded in the 1960s by a number of Stanford grads (and later helmed by the great Paul Draper, another Cardinal alum), Ridge is known for high quality wines, from Chardonnay to their prized and expensive Monte Bello Cabernet. They also make a full lineup of Zinfandels. So. I wanted to host a wine tasting for the Nota Bene, so what could I do? I’d already done a Spanish and a Burgundy wine tasting last semester. Heck, why not a Zinfandel tasting? 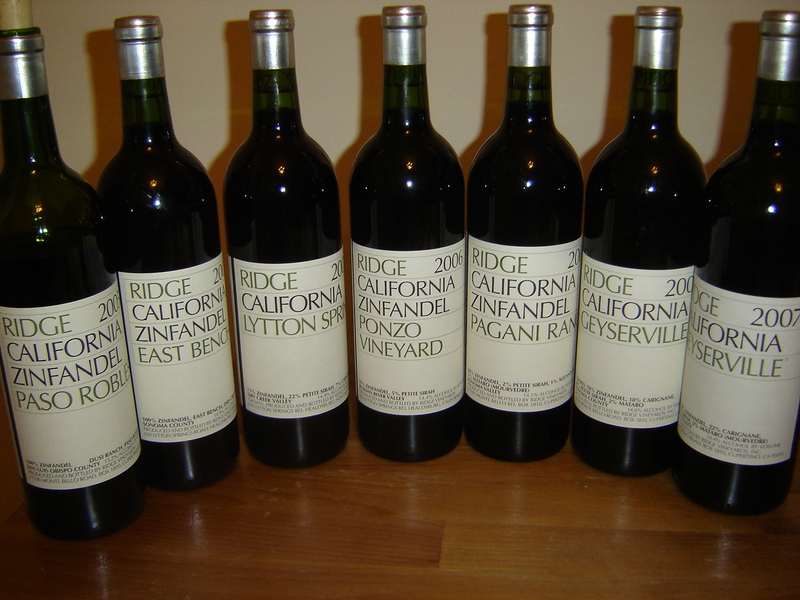 And why not a Ridge Zinfandel tasting? The ten-person panel first tried small pours of the first four wines, then took a food break (people were already getting drunk by this point, what with these Zins clocking in at a pretty significant ABV range in the low 14%s to a high of 15.2%), after which it tried the last three wines. Good lordy, what good wines. I had previously tried and liked the 2007 Geyserville and the 2007 Lytton Springs. 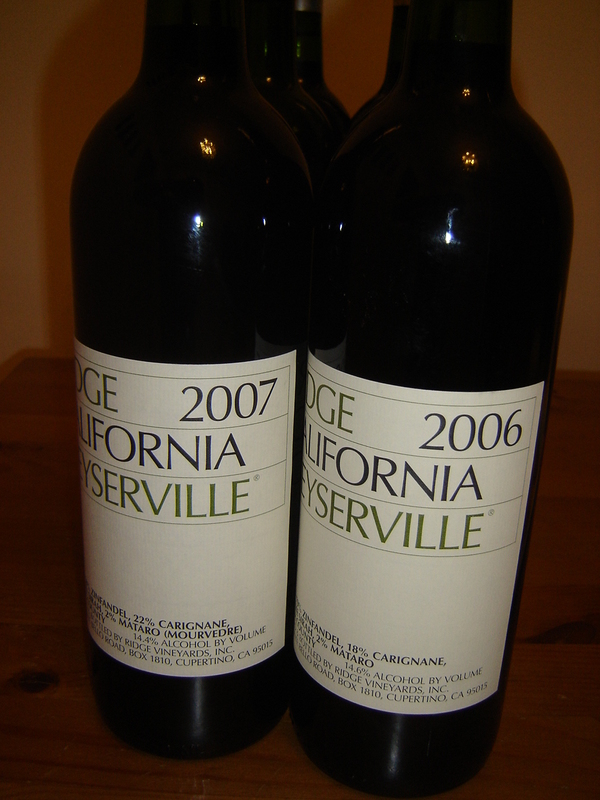 I was especially looking forward to the 2007 Geyserville again because it made such an impression on me that last time. However, the big winner was the first wine: the 2005 Paso Robles. This wine was a limpid, opaque color, but what it lacked in color it made up for in nose and body. On the nose were currant and baking spices like cinnamon and clove, some leather. The taste was undeniably port-like, with a concentration of dried fruit that was balanced with juicy tartness, like a baked apple. There was also some hints of copper or clay at the end. The body was characterized by excellent structure and balance, and it had a wonderfully long finish. This was the consensus favorite of the evening. In comparison, the next wine–also 100% Zinfandel–was less well-integrated than the first. The East Bench seemed hotter on the nose and tasted a bit vegetal, with plum and cedar fighting with stem and green olive. The finish was hollow, and there was a touch of rubber boot as well. To be fair, this was the first bottling from the East Bench vineyard, so it’s bound to improve. In fact, I’d like to lay down a few bottles to see how they develop over the years. In my opinion, the Ponzo was the most feminine of the wines, which makes sense because it’s from the cool, Pinot-dominated Russian River Valley. I thought it had a smooth, gemlike quality to it, a flavor of cherry and bright berries washing over worn round stones. This had a very light body and a peppercorn finish. It was a SUPERB match for aged Dutch goat gouda. The Pagani Ranch was, if my notes are accurate, “a veritable cornucopia of fruit,” with black cherry predominating. This was a plush wine with a pleasing finish that was–again, if my notes are accurate–“smooth as f*ck.” It was a hedonist’s dream paired with dark chocolate-covered almonds. The 2006 Geyserville was, well, disappointing. Again, green vines, with a hint of roasted ginkgo nuts (a Korean thing) and a plasticine finish. Much more tannic than the previous wines. Eh. But I was expecting more from the ’07 version, which came next. Strangely, the ’07 was not as spicy or peppery as I remembered. And the 2007 Lytton Springs was undistinguished (though it was great with blue goat cheese). I am convinced, however, that the 2007 Geyserville and 2007 Lytton Springs were somehow affected by the sheer number of wines (and food) we tried beforehand. My notes from this particular tasting should not, I hope, dissuade you from seeking out these wines. I still highly recommend them. Vineyards and vintages make a huge difference. I would love to try different vintages of the Paso Robles. The Paso Robles is 100% Zin unlike most of the others in the tasting (which are usually “field blends”)–thus, there are fewer factors to confound the tastebuds. However, the big takeaway for me is that there are some excellent producers in California producing excellent wines. Ridge Vineyards is definitely at the top of the list, and its wines are as a whole pretty exceptional–yet more reason to love the state! ← 100th Post on Vinicultured! A few of their wines, Lytton Springs especially, can really tighten up and appear monolithic in their youth. These wines to lay down for a decade or more. Other ’07s are drinking great already, such as the Pagani and East Bench I tried recently. Reading back what I wrote–yes, that’s right! Paul Draper was hired a bit later by the founders. Thank you for pointing that out. Schneider’s–the place I went to get most of the wines–had for a while a number of Ridge Zins from the mid- to late- 90s but, of course, they had sold out before I got there. It would be great to do a vertical or two and see how the wines develop! YES. Although if it were really heaven I think there’d be a bottle or two of Monte Bello Cab in there as well! Wonderful article, and wonderful tasting! Thank you so much for your attention to our wines, and of course, should you ever be in the vicinity of Ridge, please don’t hesitate to contact us for a visit! Thank you for stopping by my blog, Christopher! When I think of Zin I think of Ridge. Keep up the great work! Great writeup and experiencing the full range of Ridge zins side by side is an experience every wine drinker should have! I love these wines because they are not all about being ball-busting high-scoring hedonism-fests. They actually require a little thinking to appreciate and they confound those looking just for simple quaffability or likeability. That and their aging potential make for some great wines. Thanks Shea! This was one of the more enjoyable tastings I conducted. As for the Monte Bello vertical, I’ll call you–in 30 years.